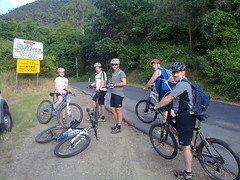 We did an epic ride around Mt Glorious again today – this time with some amazing mountain bikers from MTBDirt.com.au. 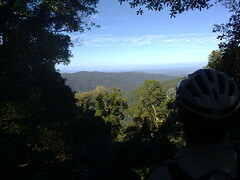 This involved some tough climbs to Mount Glorious, and then a bone jarring steep downhill ride down the Lepidozamia Track. This track has to be seen to be believed with some incredibly steep sections, strewn with rocks, sticks and logs. It was doubly difficult for me this time as it was my first serious bash on dirt using my new clip-in pedals which still occasionally refuse to free my feet when I need them, which results in some humiliating “gumby stacks” where I come to a stop and just fall sideways for no apparent reason. 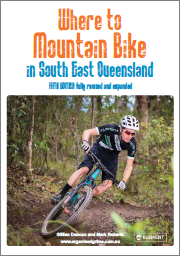 I was impressed with the skill of the other riders – powerful hill climbers and amazingly nimble over some of the more rocky sections. 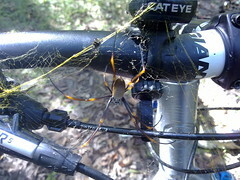 Despite this, they were patient with me, waiting for me when I dropped behind, and never complaining about it. The view at the top was breathtaking.